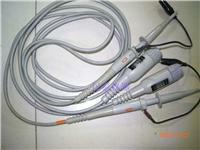 The Agilent 10073C passive probe is our most rugged 500 MHzprobe. With a 10:1 attenuation ratio and high 2.2 M ohm inputimpedance, it is ideal as a general purpose, high bandwidth passiveprobe for the Agilent 300 MHz - 1 GHz 6000 series, and 8000 seriesoscilloscopes. The probe identification feature automaticallyconfigures the oscilloscope for the probe attenuation. The following accessories are included: retractable hook tip;orange, white, blue and green identification tags; ground bayonet,IC probing tip, adjustment tool and an alligator clip groundlead.